2K Sports certainly know to diversify a franchise. While most game publishers are looking for a way to hook their brands on the next best thing, 2K Sports decided to make use of a gaming technique older than video games themselves. They’ve brought in card battles. WWE Supercard is card fighting game where each card features the strengths and weaknesses of classic WWE Superstars and current fan-favorites. 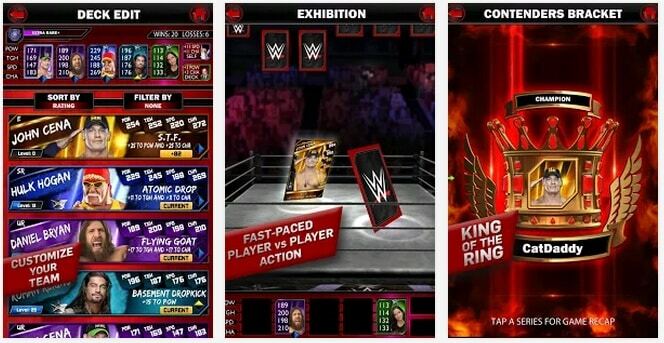 It features two game types: King of the Ring and Exhibition matches. Exhibition is a one-on-one match against another flesh-and-blood player’s deck of heavyweight wrestler cards while King of the Ring is a season-long string of matches. Players set on beating the game will opt for King of the Ring while players who want bragging rights over their friends and complete strangers will choose Exhibition for a few quick thrills while they wait for their videos to buffer. The playing cards show each of the wrestlers’ physical attributes such as Speed, Strength and Toughness which determine how successful they will be in the ring. Matches are set up as rounds with each one based on a particular stat. As the lord of your deck you get to decide which Superstar you want to send in to represent you and decide on a strategy that will help you defeat the attacks that your opponent hopes to dish out. To help your wrestler and give them the edge in battle, there are also item cards such as chairs which are effective at knocking strengths points off of opponents and ladders or tables to smash them with. The cards in the ring actually battle each other and you can see one card whipping out a chair to smash the other card with it. This is fun to watch and the mechanics of it are enough to keep players engaged for a time. After smashing about with the cards that you have in your deck the emphasis of the game switches to collecting all of the 400 cards with the golden cards being Legend Cards of The Rock, Hulk Hogan, Rick Flair and others with special versions of these legends that are hard to find and much more powerful than regular cards. For die-hard fans of the WWE, getting a legendary ‘The Rock’ card is like Christmas. The game has to be purchased however in this age of In-App purchases players will be glad to know that upgrading their cards doesn’t cost anything so improving your stats is based on how well you manage the cards that you already have, by either trashing the less desirable ones or by combining duplicates to create more powerful versions. This is a game that will only interest you if you are into sports. The card fighting is nothing new and if you’re a player who likes to play card fighting games then you may be better off with one of the many free options in this genre. 2K Sports tried hard to make their game unique by using the music to bring the pomp of tempo of the audience to your screen however most players will prefer to play it on mute as the soundtrack is terrible. This is the first card-fighting game in the WWE franchise. They did well for a first foray into the genre however 2K Sports are sure to find ways to improve on this tittle. Its shallow nature makes it a poor recommendation for people who aren’t already WWE fans however since they already have a strong following, that is not a problem for them. Sometimes when playing WWE SuperCard, bluestacks ask you fee to pay but gives you option to download some apps. Every time it asks you just select “Install apps” and continue using it free. I hope you enjoyed this guide, please rate and share. If you have problems running WWE SuperCard on desktop or any other issues, leave a comment below.